President Muhammadu Buhari has expressed optimism on the release of more of the kidnapped Chibok girls, after 21 of them were freed by Boko Haram, following more than two years of captivity. 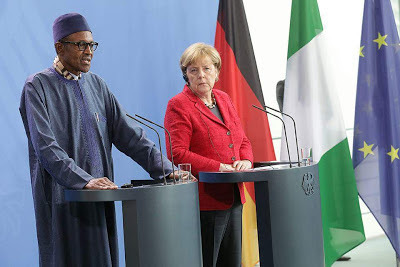 Speaking at a joint press conference with the German Chancellor Angela Merkel on Friday in Berlin, President Buhari said negotiations will continue until all the girls secure their freedom. "On the Chibok girls, we have been able to secure the release of 21 of them, so over 100 more are still in the hands of the terrorists somewhere in the Lake Chad Basin area which include Cameroon, Niger and Nigeria. “In getting this 21 out, we hope we will get enough intelligence to go about securing the rest of them. "We are very grateful to the UN for their participation in trying to secure the release of these girls. ``Please don't forget that as a result of terrorism in Nigeria, no fewer than 37,000 Nigerians were killed by Boko Haram. “Right now we have about two million people in IDP camps, 60 per cent of them are women and children and 60 per cent of those children are orphaned. “This is a major challenge for government; we have to provide face infrastructure especially for education and health, take them back to their villages and towns and reintegrate them so that they can have normal life,’’ he said. The President thanked the German government for their humanitarian assistance and support for Nigeria in dealing with the effects of terrorism. Responding to a question on the BBC interview with his wife, Mrs Aisha Muhammadu Buhari, the President said his wife and the opposition needed to appreciate the depth of the problems he met on the ground. He caused laughter at the press conference when he jokingly said: "I claim superior knowledge compared to her and the opposition,’’ referring to his three attempts at the polls to become President of Nigeria over a 12-year period, succeeding in the fourth attempt.